For full resolution/full size pictures above: click here. Jpegs captured from in-flight video documentation. Die Another Day, released in American theaters November 22, 2002. Yes, those are PHASST gliders carting superspies James Bond and Jinx Johnson (played by Pierce Brosnan and Halle Berry, respectively) into the face of peril. They're the reason Kinetic Aerospace Inc. pulled the PHASST test flight photos off the company's www.kineticaerospace.com web site for a year. 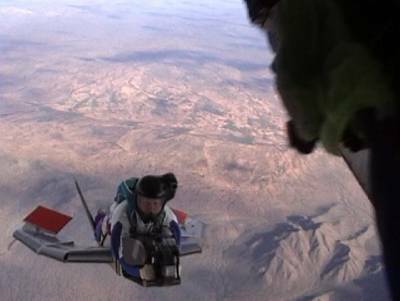 Amazingly (amazing at least to KA's lead designer, Jack McCornack), the producers of the film wanted the Switchblades to look like the version Kinetic Aerospace flew at Eloy, AZ in January 2001. "I thought their art department would go crazy with [the Switchblades]," said McCornack, "but they wanted them identical to our first flight test model, right down to the paint job." According to Kinetic Aerospace's president, Dave Rogers, this put the company in a bit of a quandary. "We were honor- and contract-bound to keep the Switchblade image and information under wraps," said Rogers. "Since Switchblades look and fly just like PHASSTs, we felt the most discreet thing to do was to block public access to kineticaerospace.com until the film was released." Rogers acknowledged the company's other projects are not publicly accessible at present, saying, "If we couldn't keep secrets, we couldn't keep customers." McCornack claims he was pleased to see how director Lee Tamahori handled the Switchblade scene. "It's brief, but realistic," said McCornack, "The good guys get in unobserved, thanks to a fast cruise, good glide performance, and minimal radar signature. It's a wonderful promotion for the PHASST." 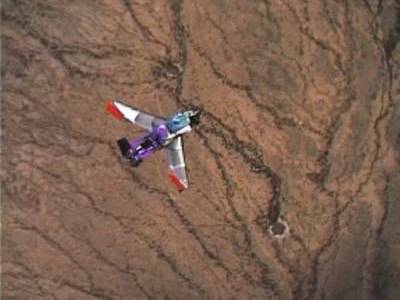 ELOY, AZ: Early in 2001, a new breed of aircraft took wing two miles above the Arizona desert. The PHASST (Programmable High Altitude Single Soldier Transport), pronounced "fast" flew three test missions in January, launched from a Skyvan jump plane and landing in desert rangeland near the Picacho Mountains, east of Eloy. All three launches were at 12,000 feet, with development pilot Allan Hewitt separating from the PHASST at 6000 feet and landing under his own canopy. The PHASST is designed to carry a paratrooper or skydiver, and as such is designed around parachuting skills rather than airplane pilot skills. The PHASST pilot flies in a "tracking" position (prone, head forward), the aircraft is dynamically stable in all three axes, and like a parachute, has no elevator, rudder, or aileron input. Instead, the pilot has brakes on each wingtip, which control direction and drag, much like the brakes on a ram-air parachute. Hewitt was chosen for his considerable parachuting experience, which includes a stint with the British Army's Red Devils display team, and also his powered parachute experience, which includes stunt piloting a Parahawk in the 19th James Bond film, The World is Not Enough. He met PHASST designer Jack McCornack while both were working on that film, on location in the French Alps. "We needed someone who would be a quick study, since we couldn't draw from a pool of pilots who had flown this sort of thing," said McCornack. "There is no 'this sort of thing.'" Described as "more something you wear than something you ride," the PHASST is contoured to fit the pilot, with the pilot's arms and legs fitting into recesses in the fuselage. Sweep is variable in flight, with a minimum wingspan of 5-1/2 feet for deployment from the transport plane and rapid decent, and a maximum wingspan of 8 feet for cruise and slow flight. The PHASST is launched tail-first with wings folded, from the rear ramp of the transport plane. Once free of the plane, the PHASST pilot spreads the wings and begins a high speed glide to his destination. On arrival, he releases the PHASST and tracks away, then opens his parachute and lands in the normal skydiving manner. The PHASST can then land under its own canopy, or fly unmanned under remote guidance or programmed instructions. According to McCornack, the first flight tests were meant to "...practice the launches, make sure the pilot can get clear [of the PHASST] easily in flight, and prove the practicality of the concept. And though we intend the PHASST to literally fly itself, Allan needs some time on it before we can explore its performance envelope." Current PHASST test projects include autopilot control and autonomous navigation by GPS, which allows the PHASST to follow a preprogrammed course without pilot input. The pilot will be able to overpower the navigation system through use of the wingtip brakes, should the situation warrant such action. Hewitt reported the PHASST was "a rock steady jump platform" for his two low speed (100 mph) separations, but "a bit of a handful" in his one high speed (197 mph recorded) separation. Hewitt recommended future PHASST pilots "...put on the brakes before bailing out." Three chase jumpers videoed the tests, and found the task challenging. "When Allan circled, we dropped right past him," said Andy Bennett, rigger and jumpmaster for the flights. "and when he put the nose down and tracked, he shot off toward the horizon much faster than we could go." The tests were a joint effort by Kinetic Aerospace Inc., which built the PHASST, and Sky Science Inc., which provided the pilot, rigger, recovery system, and cameramen. According to Kinetic Aerospace marketing VP Dave Rogers, the next manned tests will involve two PHASSTs, so "...the cameraman will have a way to keep up." He said future development plans include a turbojet powered version, which is expected to cruise at 180 knots and have a 100 mile range. Rogers explained the six month delay between the January 2001 test flights and the release of information as "...a courtesy to a customer, but now that we've met those needs, we're ready to brag." The company is seeking clients in the military, film, and recreational markets, for both the glider and turbojet versions. For more information contact Dave Rogers at drogers@kineticaerospace.com or 850-668-6363, or write Kinetic Aerospace Inc., PO Box 50103, Eugene, OR 97405. PHASST EXIT With wings swept, Hewitt deploys both brakes and backs out of the Skyvan. A cameraman is exiting to the right. PHASST CRUISE With wings spread to full span, the PHASST "flat tracks" below a video cameraman.